The weather was pretty poor with heavy rain through the day. The number of people waiting for entry on Saturday was well down to the squeeze we usually encounter near the gates. Good wet coats and wellies or stout shoes were the order of the day. Ford Capri Mk1 is in extremely short supply. there were plenty of cars for sale and oddly a good percentage were Jaguars. Some stalls remained covered over all day, others braved the weather making their stalls as waterproof as possible. There was plenty of room around the food and drink stalls, usually you struggle to find a seat, the stall holders looked pretty fed up. We spent a lot of time in the marquees looking through books and old racing magazines, for 'old' Capri racing news, for our own archive. Managed to find a pair of strut tops for a club member. We stayed all day but it just didn't have a buzz this year. However we are now looking forward to the September jumble. Now in its third year and getting bigger with each show, this is our first time showing club cars. We had a club stand at this event for the first time luckily we had some fantastic Capri's to display. I mean who wouldn't want to see a very poor - rust holes everywhere - RS3100, then nearby a freshly restored RS3100 as well as the GXL that we are following on the website under restoration - loads of photo's of this restoration on the site. To say the three cars caused a stir would be an understatement. The public interest was amazing, the stand was busy all the time, so many people who owned Capri's stopped by for a chat. Really enjoyed the weekend with like minded enthusiasts' and the great guys who owned the display cars. We have just renewed our Capri insurance with Footman James. 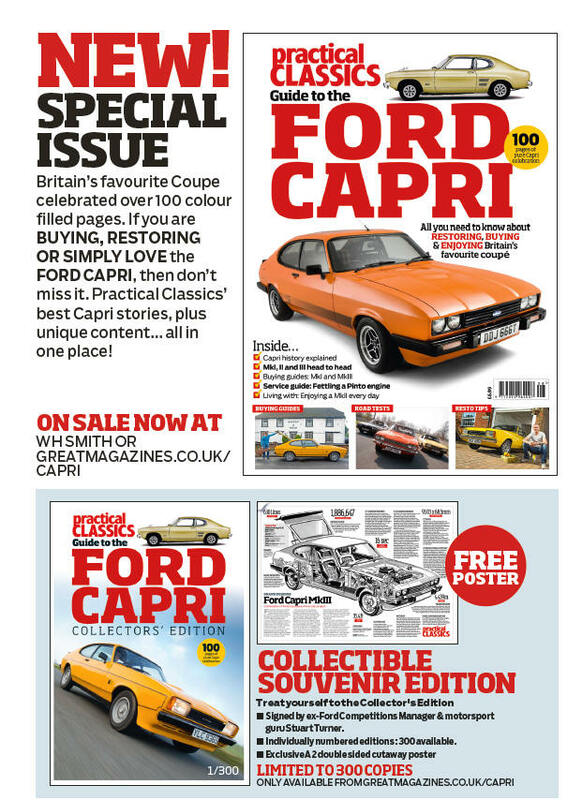 Happy with the cost and the level of cover, plus good discount for Capri Mk1 REGISTER members. If you are planning to go to shows in the Midlands this year then give Roger a call as he is organising club stands at some events. We will be at shows such as Powderham Castle and Plymouth Hoe. Big events. We would welcome other Capri owners to join us in displaying our iconic cars. In this edition members restoration, Capri's around the world, NEC report. Great to see so many old friends and club members a big welcome to all our new club members. Picture below but for more pictures click on the Facebook page. Last year we bought you 3 RS3100's - we were told we would be lucky to get one but Gareth came up trumps even getting us a barn find. So what about this years display? We have a Ford Production Touring Car one of only 3 GXLs made at Boreham Wood, does XWC 713L ring any bells with classic racing fans, driven at one time by Prince Michael of Kent, Tom Walkinshaw, Jeremy Walton, amongst others. and for those who like their Capri's bog standard, a well known Sebring Red GXL. June - Had a visit from Wim and Irma Capri fanatics from Netherlands - they made a detour from Dover to deepest Devon then travelled up to the Classic Ford Show. They brought with them photograph albums of the Netherland Capri Club shows. Still plenty of enthusiasm but like here fewer members. Well worth a visit to their show in Netherlands, very friendly. Went to Radio Devon children in Need classic car show at Plymouth Hoe. Arrived at appointed entry time of 11.00am surprised to find the place already full of classics. 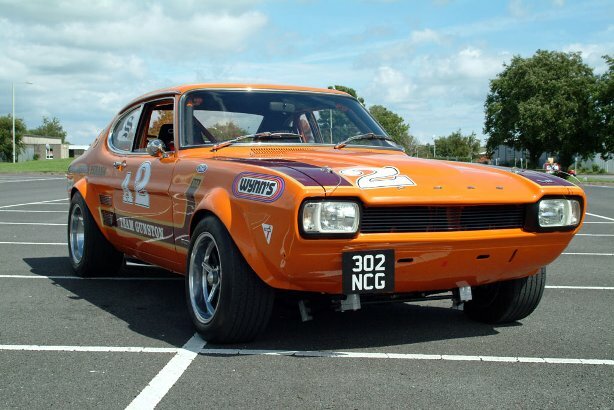 1.00pm my Capri Mk1 was one of only 4 vehicles still on the Hoe, what had happened? It rained and all the locals made a dash for home as soon as the dark clouds gathered. As we had a 50 mile trip back we were gonna get wet anyway so waited to see if it would stop , it didn't and at 3.00pm it was all over. Arrived home to find beautiful sunshine, neighbour said it had been sunny ALL Day - THAT'S THE WAY IT GOES SOMETIMES. What a wow of a show this was, bigger and better with all manner of classic cars from the age of the invention of the car to modern day up to the minute Jaguar proptype the CX- 75 valued at £750,000, - bit of loose change anyone? We had a fantastic show. At times it was impossible to leave the stand the crowd was so dense, and all wanting to get up close to have a real good look at the iconic Capri RS3100's that we had on display to celebrate the 40th anniversary of the production of this the last Capri Mk1 model. It was common knowledge that I wanted three of these cars on our display but with less than 46 being recorded as survivors and of these few are actually on the road, it was a big wish list. however I have a very good friend who is well respected and an RS3100 owner too so he rounded up a barn find (still in barn condition) a beautiful above average condition RS3100 and a superb concours winning Capri RS3100....what an amazing stand we had, no need for anything fancy people just wanted to look and look again at the fantastic line up of three very rare Capri's. Sorry about the colour of the picture, but I never seem to get a good picture under the NEC lights, especially white cars, they just pick up the yellow tinge. November 1973 - November 2013. At last a fine dry day so we decided to fire up the Old Spice Capri. The engine spat into life - you would never have thought it had stood outdoors for the last 5 months. The clutch plate must have freed when we towed it down the lane, as it was no trouble to drive forward or reverse. Maybe we will get it to a show ....one day. Don't forget to buy your tickets for the Classic Motor show - November 16/17/18 -early to get the best club discounts, all you need is your club membership number. What a year it has been, shows have been cancelled up and down the country because the ground has been waterlogged. I was looking forward to Powderham Castle classic Car show - a show that is usually well attended but it was cancelled due to rain. Route 38 club ran a show on Plymouth Hoe in August, and I booked in my Capri. It was a bit foggy when we set off about 8.00am but by the time we reached Plymouth about an hour later the fog had given way to rain. We were disappointed to find only a half dozen cars on the huge Hoe. After parking up and chatting to the neighbour who was the proud owner of a 1949 Triumph Roadster in go faster red complete with dicky seat the sun came out and as if by magic cars started to arrive. within the hour the hoe was almost completely full with all manner of classic cars and bikes. Plenty for everyone's tastes, including several American limousines and the old American trucks which are very much sought after and in demand these days, there were half a dozen or more of Shelby Mustangs, from the 60's to new, and no American club would be complete without the hot rods and they made a great show. 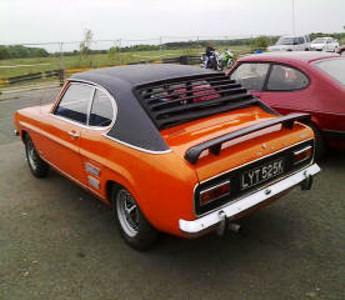 Of the Capri's well - there was my Mk1 and a silver Mk3 which sported a V8 Rover engine. This turned out to be one of the best day's out this year. We used to visit Paignton for our annual hols and would have a browse around the car show, I always said I would like to display my Mk1Capri there and so this year I had the chance. My booking was accepted (apparently you have to be chosen and my car was) and on a rare sunny Sunday morning in July I set off down the A30 for just over an hours drive to Paignton. It couldn't have been a better day for a ride out. We arrived good and early and was directed to our spot for the day, we hadn't been parked more than a few minutes when 'Jobsworth' came along, instructing me to go forward go back to the left to the right no the other way - till in the end I said I would leave the show. He grumped off to the next car and the procedure was the same with him nearly receiving a punch on the nose. He was also trying to make the car owners park within a foot of each other, he obviously has never been in a Capri as he would know how wide the doors are and even a small child wouldn't get out of a Capri parked that close. anyway he finally moved off to annoy someone else and we went off to find a bacon sarnie to calm ourselves down. The day got hotter and the visitors were in and around the cars, the sea front seemed packed that one day with everyone enjoying the sea, sun and classics of which there were some beautiful cars. Tavistock steam and vehicle show. should have stayed home today, the weather forecast was for rain but this sort of rain is unprecedented - it threw it down solidly- we felt like prisoners trapped in our car. Only around a dozen cars showed up- mostly Morgan's who had a club meet and they started leaving after lunch, we didn't stay any longer, such a shame to see drowned Morris Men dancing for the lord and lady Mayor in such awful conditions. The locals said it came down off Dartmoor. We took our picnic lunch home with us. Met up with another Capri Mk1 owner, Mike owns a 1971 1600GT, there doesn't seem to be too many of us down here, was nice to see his car at this show. Went into the arena with my car, just a bit of posing, but some nice comments by the MC, and nice comments from the public too. Only a small collection of classics compared to what we were used to in the Midlands, but friendly. Club members get big discount on advance purchases of tickets quote CLUB11 single tickets CLUBF11 family. Who won the OLD SPICE Mk1 Capri in a draw - I did. The car is in need of TLC physically but the engine is sound, we drove it from Evesham to Devon and it didn't miss a beat, going to have some fun with this one. It has had 11 previous owners and though it is looking a bit the worse for wear somewhere along the way it must have been looked after to have survived to 40 years. If any previous owner is reading this then please get in touch with us at emailus@caprimk1register.com, we'd love some history. 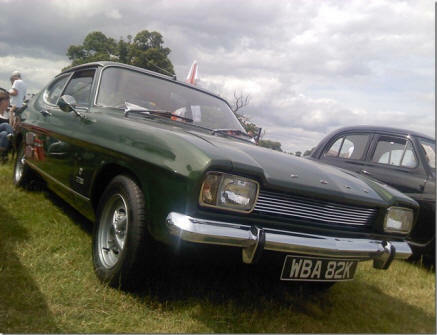 Capri Power at MALVERN August - did you miss it? Shame as it was a great day out with more cars this year at this great Capri get together. My own car was the oldest and also won the Best Capri award with Capri Power winning. sunshine, Capri's and pleasant company - what more can you want. 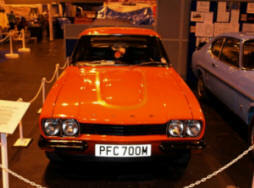 We were proud to display 4 Mk1 Capri's on the REGISTER club stand and each one a credit to their owner. Pictures in this months magazine . Also a warm welcome to all the new club members. Thanks to Kevin and his team for a superb day out at a first class venue. The sun shone down on 209 Capri's as well as Concorde. We are glad we didn't miss this one. Looking forward to 40 years of Capri - join us at outdoor shows and display your Capri Mk1 proudly. Great to see so many Capri Mk1 owners at the BIG BRRRRM Show nice talking to you all. The Capri Mk1 REGISTER the club for Capri Mk1 owners had a fantastic stand at this huge show. Spanning 4 halls plus the MPH show it made for paradise for all car, bike enthusiasts. Go to the forum for all the latest news and pictures of the club stand. At the London Ally Pally show we had room for only 2 cars but still two real crowd pullers. We hardly stop at these shows as everyone seems to have something to say about the Capri, which is great as we like talking about these great cars. Pictures can be found on the associated webpage and/or forum. 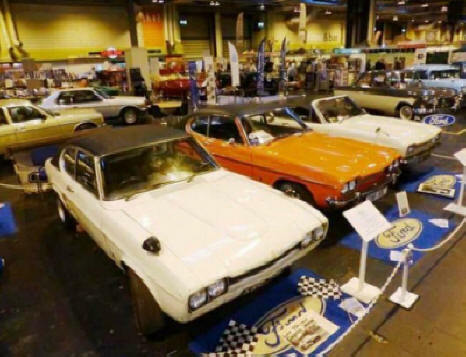 The Race Retro show had several racing Capri's on display this year - we seemed to have opened the door for them by taking a stand last year at this show. Here we met racing driver Neil Bray, a unique person who has overcome major obstacles to be able to follow his love of racing in his Mk1 Capri. We saw Neil in action at Castle Coombe racetrack Easter Bank Holiday Monday racing in his red Capri, I'd like to say he won the race but a slight wobble put him into 3rd place in a hotly contested race. We bumped into several club members down at Coombe who too were enjoying a day at the races. The London International Car Show at Alexandra Palace London. A 1600 GTXLR and a 3000GT, two stunning, good looking cars on the club stand and lots of interest from the public. Great meeting and talking to Geoff and Ken from California. 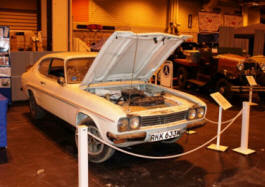 They said they were very pleasantly surprised to find the Capri's on show and spent a good amount of time with us. They also said they had Capri's 'back home'. We had a Club stand at the Classic Motor show - what a fantastic show - huge. Our 3 selected cars were reduced to 2 as the owner of one slipped a disc cleaning the car for the show, he has our utmost sympathy. However our 2 car display stunned the crowds. It is not often you see a 1300XL these days and in immaculate condition the completely white car stood out like a shining beam. Add to this a 3000E in the rarest colour - Cherry Red - what a contrast. this unique 3000E is fitted with triple Webber carbs and lots of added extra's - if you missed it you missed a huge treat. Great to see so many members at the show apologies if we didn't have time to talk to you all. 2006 - The Town and Country Festival at NAC Stoneleigh August Bank Holiday - one of the best shows in the Midlands with over 40 Classic Car Clubs taking part. We had 17 Capri's booked in for the 3 days but sadly the weather kept some of them at home, we still managed 14 Capri's though and the chance to see again the rare Ford prepared Rally car from 1970 - they were stunners every one. We are always keen to see more Capri's at this event so make a note of it in your diary for next year and come and join us. There is fun and entertainment for all the family and if your car is on our stand you go in free. Book your Capri with us now for August bank holiday 2007. Alexander Palace show March 18/19 It was nice that the Capri MK1 REGISTER was at last invited to the show, and not only were our two official club cars here but also our 'Nobbies Nuts' car and a member on the Surrey Club stand, so four MK1 Capri's to stun the public.